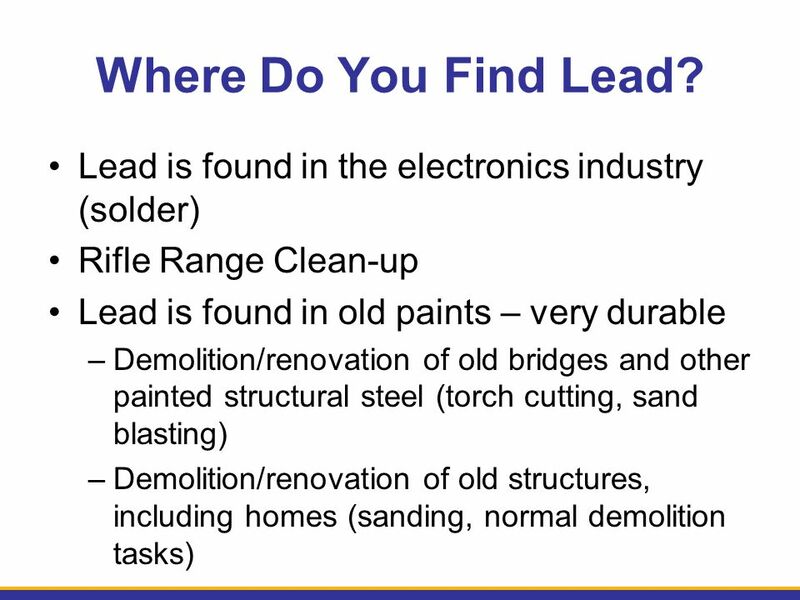 3 Where Do You Find Lead? 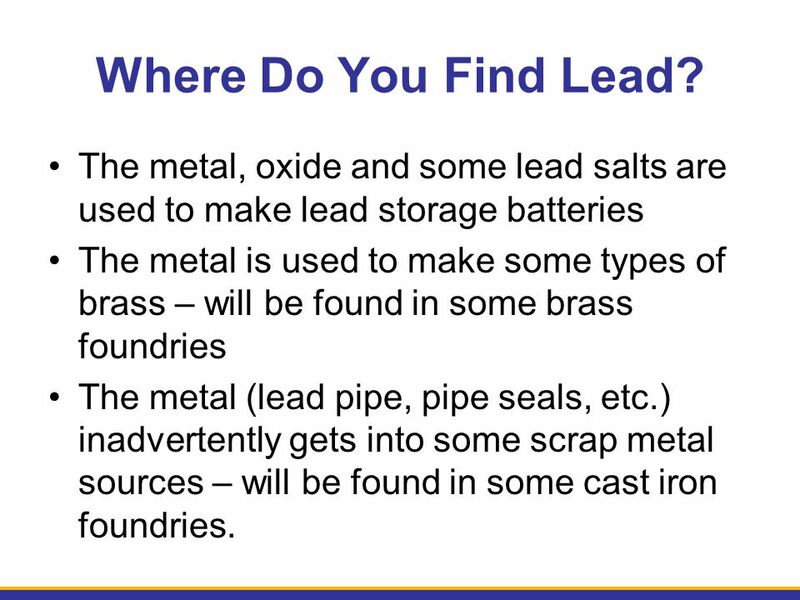 The metal, oxide and some lead salts are used to make lead storage batteries The metal is used to make some types of brass – will be found in some brass foundries The metal (lead pipe, pipe seals, etc.) inadvertently gets into some scrap metal sources – will be found in some cast iron foundries. 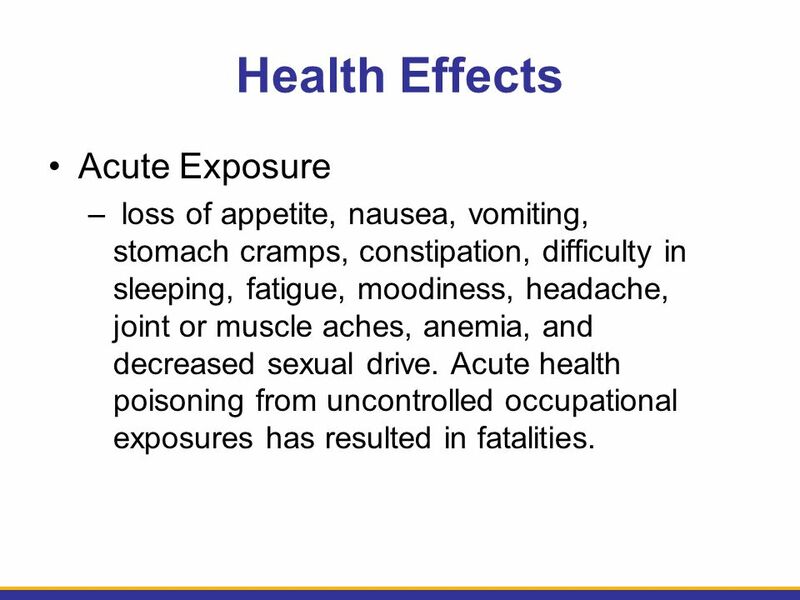 6 Health Effects Acute Exposure – loss of appetite, nausea, vomiting, stomach cramps, constipation, difficulty in sleeping, fatigue, moodiness, headache, joint or muscle aches, anemia, and decreased sexual drive. 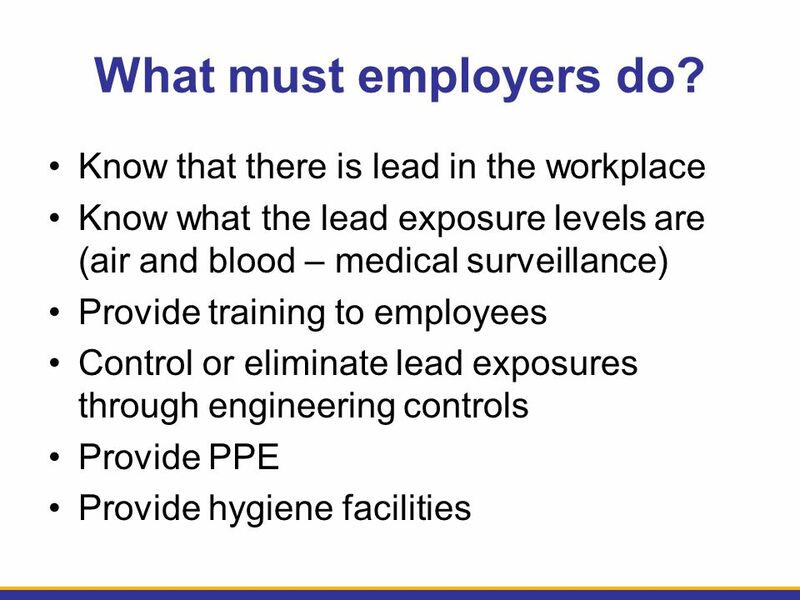 Acute health poisoning from uncontrolled occupational exposures has resulted in fatalities. 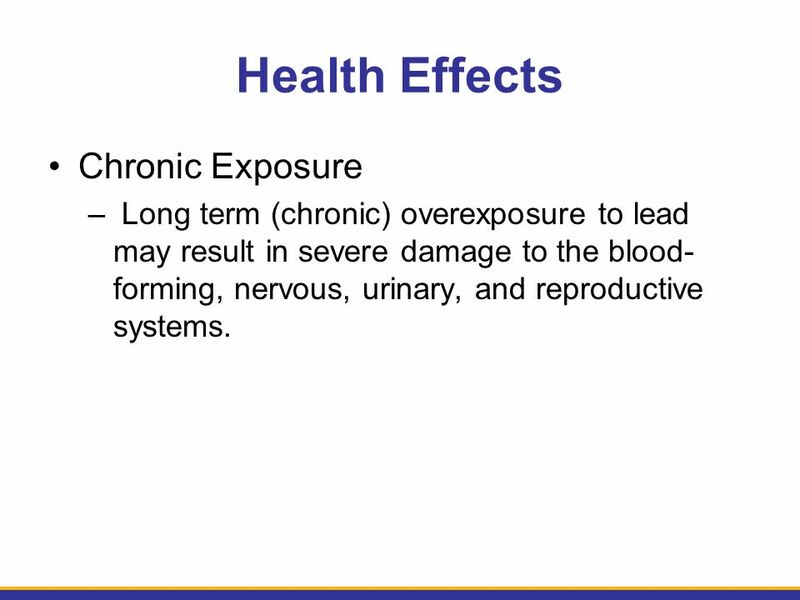 7 Health Effects Chronic Exposure – Long term (chronic) overexposure to lead may result in severe damage to the blood- forming, nervous, urinary, and reproductive systems. 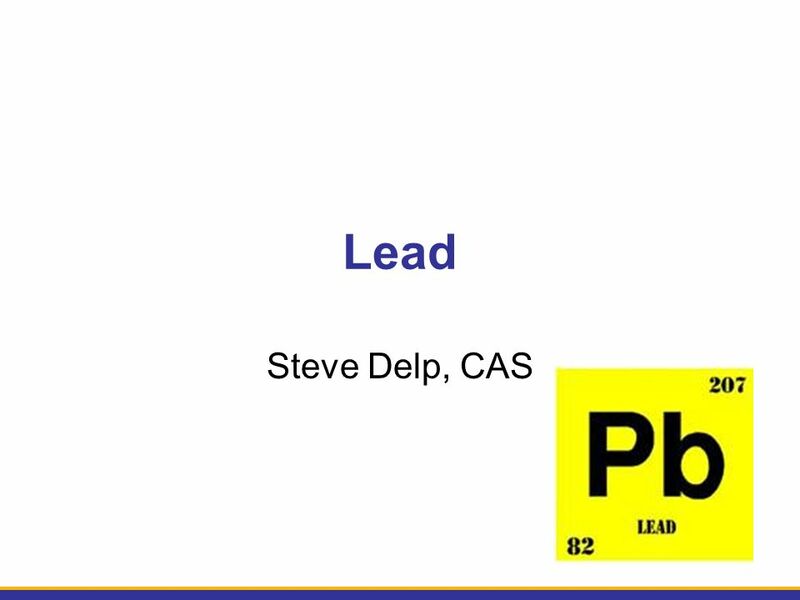 Download ppt "Lead Steve Delp, CAS. What is it? 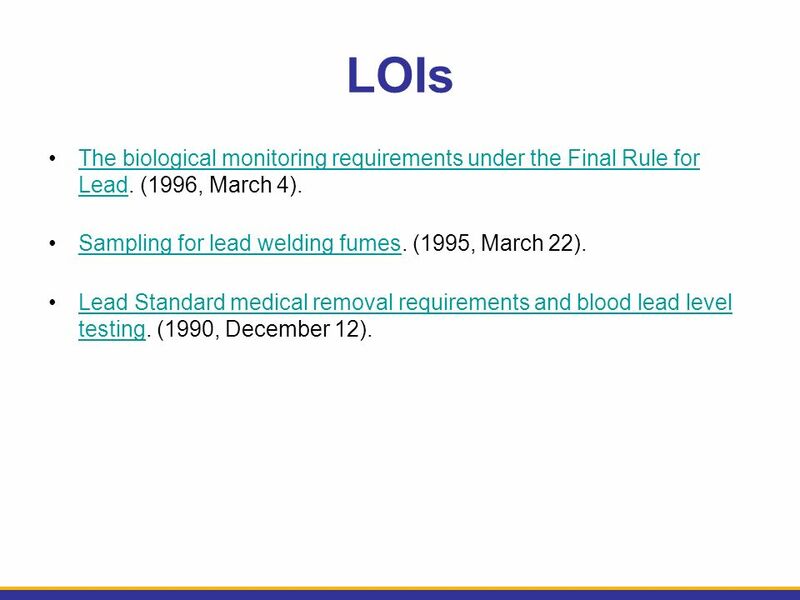 Metal Other forms include oxides (lead oxide) and salts (lead chromate, lead sulfate) Organic forms (tetraethyl lead)"
Lead Dust Sampling Technician June Chapter 1 Introduction. 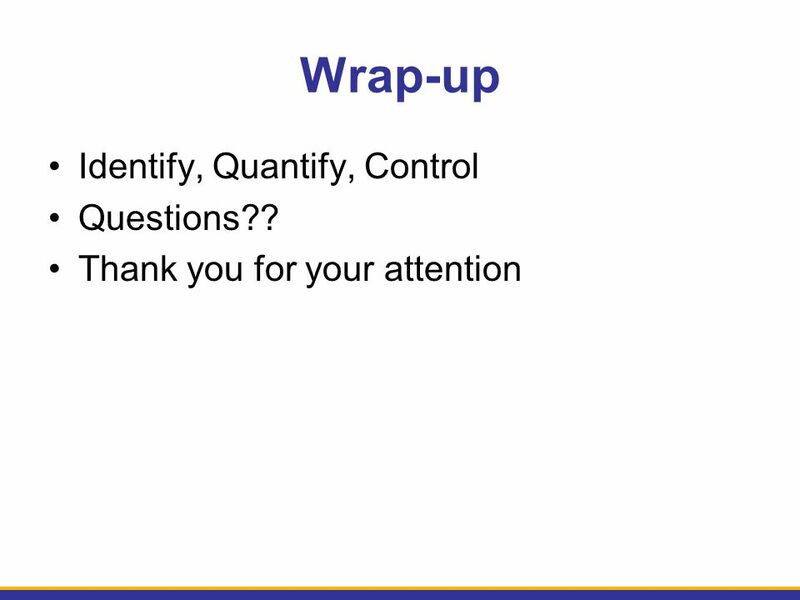 OSHAs Revised Bloodborne Pathogens Standard Outreach and Education Effort 2001. 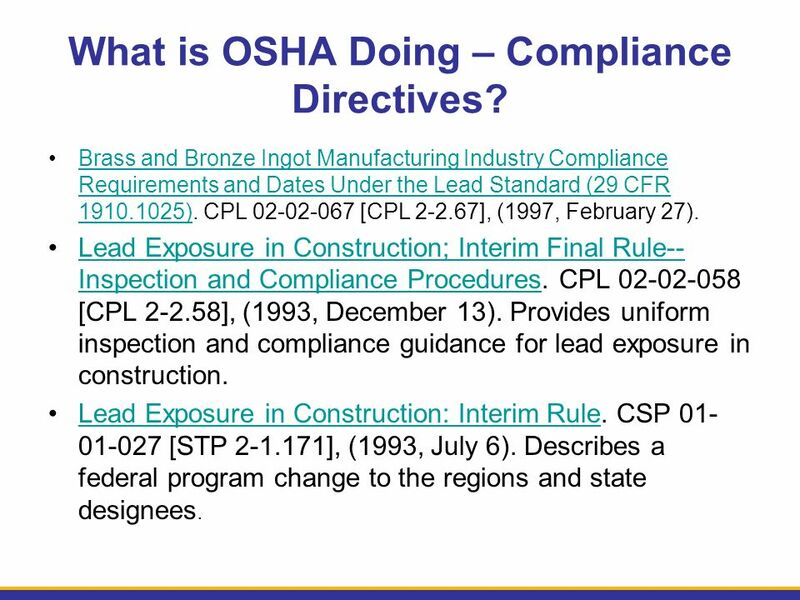 Respiratory Protection 29 CFR Scope This standard applies to: General Industry - 29 CFR 1910 Shipyards - 29 CFR 1915 Marine Terminals - 29 CFR. 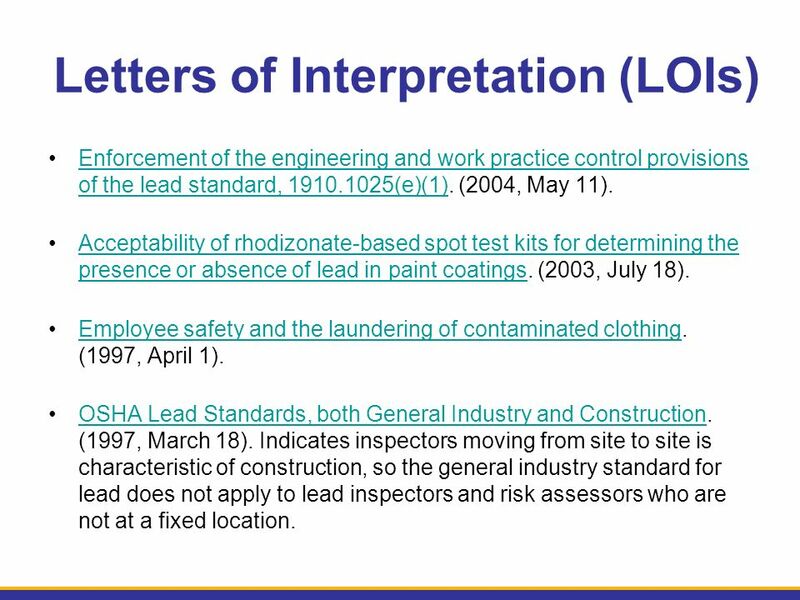 Controlling Lead-Based Paint Hazards Chapter 5 Lead Abatement for Workers Course. 13 Hazardous to our Health Hazardous Substances Solvents 5 Lubricants. 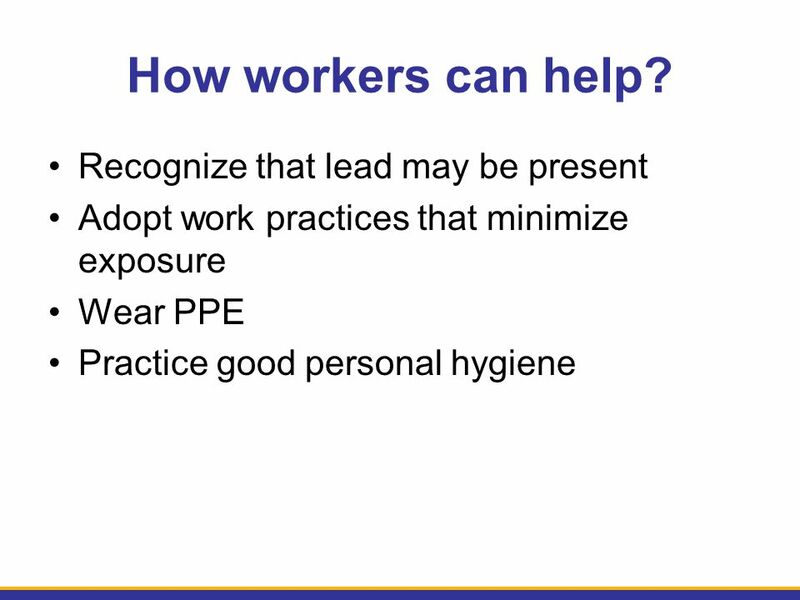 LEAD HAZARD TRAINING. 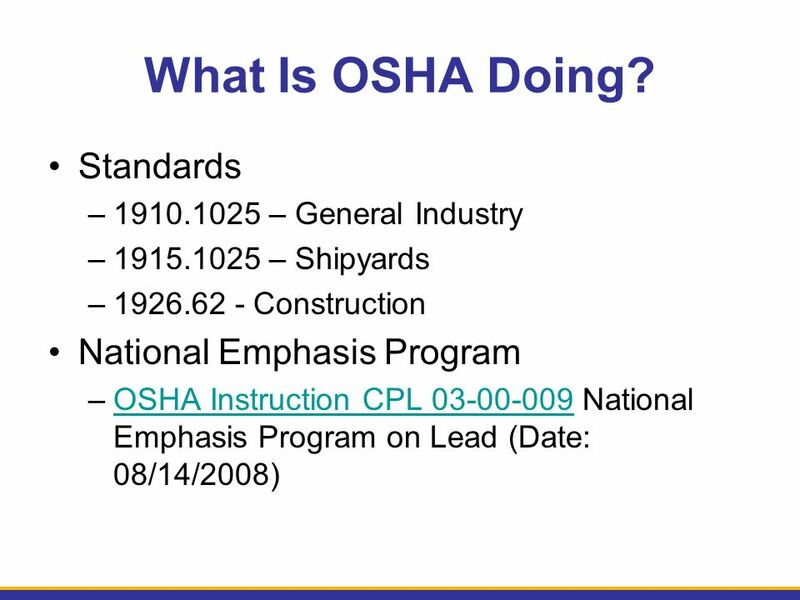 REFERENCES  29 CFR  OPNAVINST D CHAPTER 21  STATE LAW & LOCAL COMMAND Lead CFR STATE COMMAND. 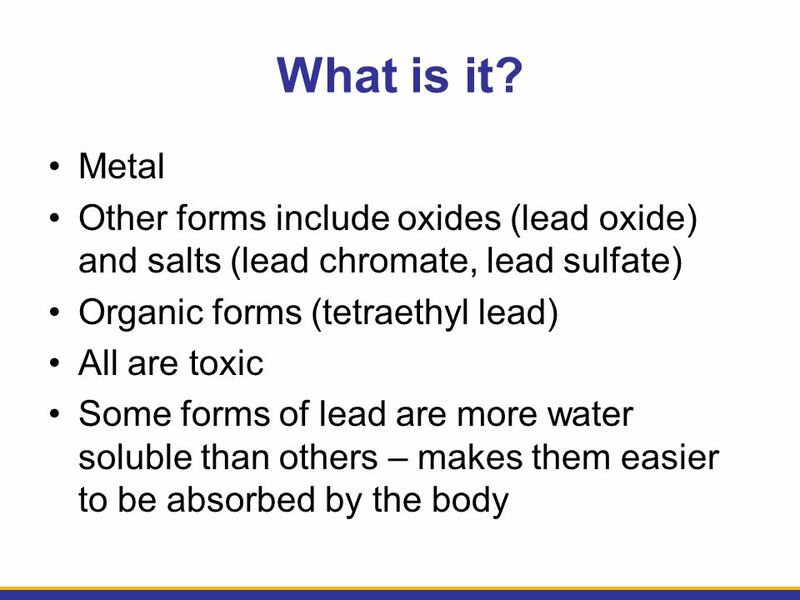 Silica – it’s more than just dust! 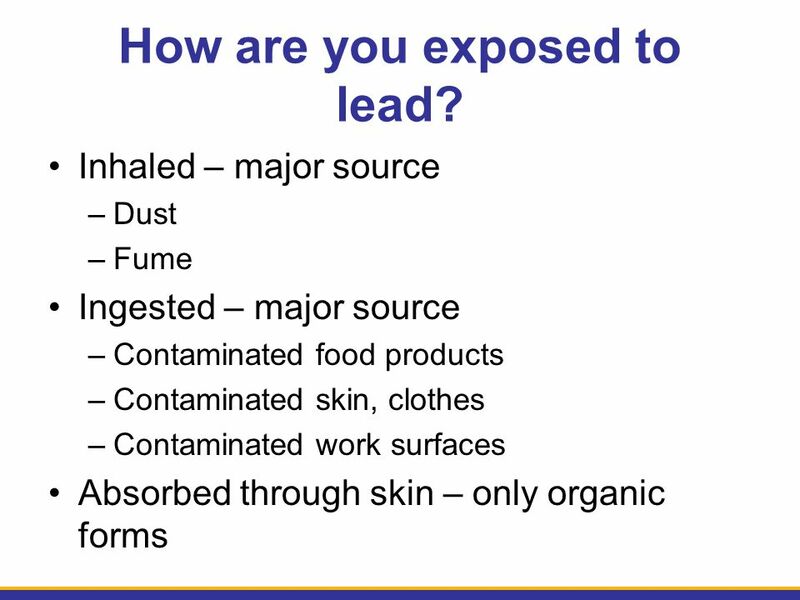 The Toxicology of E-Waste for San Jose Chapter American Society of Safety Engineers October 13, 2009 by Ed Sawicki EHS Manager.